Luminous Flux Measurements in Your Hand. Radiant power, luminous flux, CCT, and color rendering index (CRI) of LEDs. The GL Opti Sphere 48 is an integrating sphere accessory for our GL Spectis spectral light meters for the luminous flux measurement of small LED chips and other small light sources. This integrating sphere helps to achieve an ideal light distribution and proper measurement of lighting power. Use this for luminous flux, radiant power, color temperature CCT, color coordinates and color rendering properties (CIE CRI; IES TM-30) of LEDs. This user friendly accessory is an ideal tool for everyday work of electronics engineers and LED modules developers. This is also very helpful for purchasing managers or purchasing agents to select the proper components, or anytime you are in need for quick & accurate LEDs measurement. 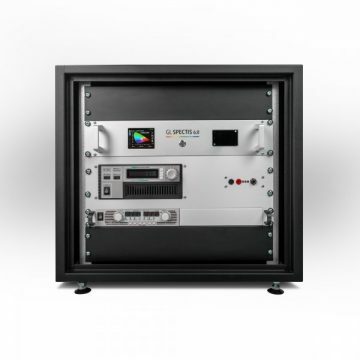 This small integrating sphere mounts directly on the spectral instrument providing the user with accurate and immediate photometric and radiometric data. 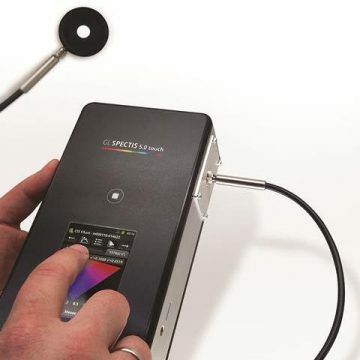 The RFID code is automatically detected by the spectral meter, expanding the measurement capabilities of your GL Spectis device to single LED measurements. 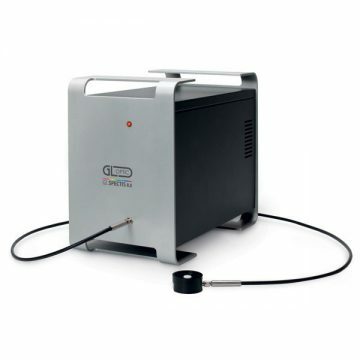 Using this device you can get the results which are traceable to laboratory standards, enabling you to make smarter decisions regarding the LED quality and select the products you need for your development, or control the binning ( color and flux groups ) during the initial selection stage. You no longer need to ask the laboratory to measure these for you. Working with different suppliers or buying different types of LEDs? Now you can easily check the light output and color of these components in a matter of seconds. Paired with the powerful GL Spectrosoft analysis suite, you can take it even further and performance extensive analysis throughout the development stage. Since then, it has become an important accessory for electronic developers involved in the LED lighting who constantly struggle with optimization of the LED output, modules, drivers, selecting optics etc. Instead of selecting the proper LEDs for development projects based only on samples and the datasheet, you can use this sphere to verify performance, check if samples are meeting specification, quickly confirm binning. If your new module is tested you can also check the light output of LEDs simply by placing the sphere on top of each LED. The same works for LED strips. 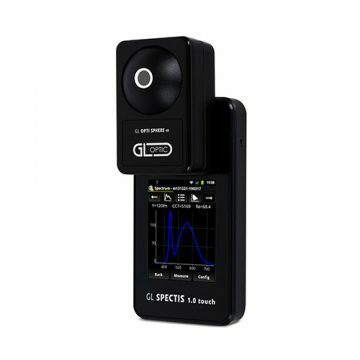 Use our spectral integrating sphere in combination with different spectral instruments for GL Optic. Check how our GL Spectrosoft binning and pass fail functions can help you with your work. Don’t let the small size fool you. This scientific grade handheld system can easily be configured with different apertures to accurately measure luminous flux measurements, wherever you need it and for any application. An optional fiber optic adapter is also available for special applications. Measure high output LED’s with using an optional high signal adapter, available for a range of different luminous flux levels. For production or QC applications, use a remote trigger accessory that includes an indicator lamp that indicates when a measurement is complete. Perfect for a noisy shop floor. Use with Spectrosoft or customer software through the API for further automation.